Yup, in spite of the freakshow they call a government and a banking industry sharing the same hip, in spite of the Dáil railroading through umpteen pieces of publically maligned legislation from budgets to four year plans to Nama, and in spite of the fact that same chamber facilitates the election of more arse-backwards moonshine salesmen per square inch than any other legislature in the known universe, it’s the Dáil’s staid older brother that becomes the focus point of everything we hold disastrous in the Irish political system. I can’t help but find that strange. Granted, the Seanad is not perfect. In fact it’s in such dire need of reform it should only be recognisable by its dental records. The method of electing Senators is byzantine and insane, as 43 are elected by vocational panels that make as much sense as a Japanese gameshow, 3 are elected by the graduates of the NUI colleges, 3 by Trinity graduates, and the 11 others are nominated by the newly elected Taoiseach. But in spite of the fact pretty much every Senate candidate touts reform of the House on their manifestos, there hasn’t been the collective inclination to action it. And now, when the appetite for wide reform is ravenous, there doesn’t appear to be the stomach for it. 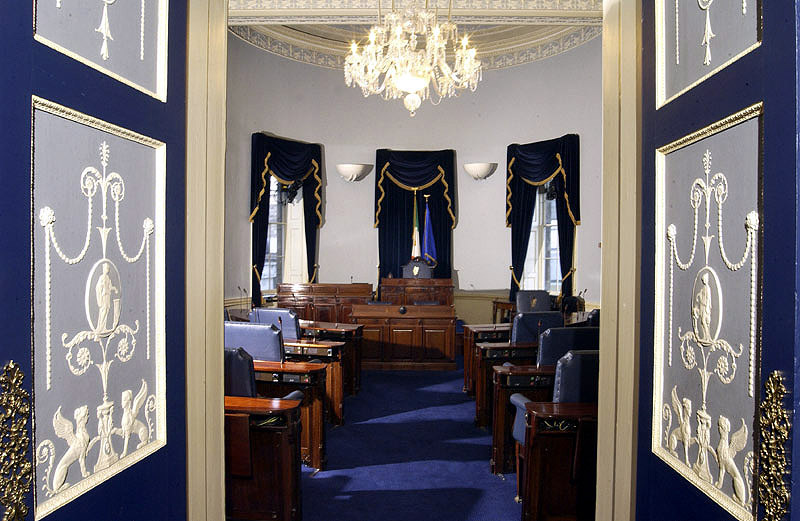 Fine Gael were the first to call for the abolition of the Seanad. Well, I say Fine Gael, it was really more of an Enda Kenny solo run, with the Senators in his own party looking like they’d been heaved out of their beds at three in the morning when asked about the issue at first. And now, Labour have jumped on that bandwagon. Although, their engineering is a bit more advanced. Brendan Howlin released Labour’s document for political reform last Thursday, a 32 page document that advocates Seanad abolition (or, more precisely, advocating a yes vote in the referendum to abolish it) as just one of the changes in a wider crusade for wholesale change of the system. When I talked to him about the proposals the day before he certainly put forward a reasoned case: countries like Sweden (widely acknowledged as the Marcia Brady of political systems) and New Zealand have unicameral legislatures and they operate well, and proper reform of the Dáil with a rebalancing between executive and legislative power, would negate the need for a Seanad anyway. When questioned on the virtue of having a Séanad as a “place apart”, elected differently to the Dáil and inhabited by people who may not correspond to localised, clientelist politics, Howlin responded by suggesting any public representative must be the choice of and have the will of the people, and if a candidate is good enough they can get elected, pointing to Senator David Norris’ strong challenge for the Presidency. While Howlin’s fidelity to the voting public is admirable, it’s well worth noting that the last two elected Presidents, Mary McAleese and Mary Robinson, both failed in their attempts to get elected to the Dáil. One woman who has also followed in both Robinson and McAleese’s footsteps as Reid Professor of Law at Trinity is Labour Senator Ivana Bacik, Eamon Gilmore’s running mate in Dun Laoighaire for the following election. Bacik too takes a pragmatic view that as it stands the case for the Séanad has failed, and she also echoed concerns about the viability of reform, saying any suggestions made would be “unlikely to please everyone” and “very hard to see working”. There’s a lot of anger and distrust in the system, claimed Bacik, which makes it so important to have the discussion as part of a wider, nuanced constitutional review. “The question boils down essentially to whether we really want or need a second chamber that represents a different configuration of the people. If so, what should that configuration be? “The Séanad, on the other hand, is not essential. It is an optional extra. Because it is not directly elected by the people, its existence is not central to the concept of representative democracy. In essence, the Labour stance is that reforming the Séanad is an enormous and complicated job for an institution nobody cares much about anyway. While that may be the harsh political reality, the invocation of indifference as a reason for abolition is intensely unnerving. Now more than ever, politicians need to combat indifference, not succumb to it. As Ivana Bacik’s argument bears out there are more than enough shades of grey on the issue to go around, and maybe Brendan Howlin’s utilitarian approach is the most sensible, but I can’t help but feel this is a missed opportunity. In an atmosphere where the amount of well-considered politicians could be counted on your thumbs, it’s worth considering some of the luminaries that have taken their seats in the Séanad over the years: Nobel laureate WB Yeats, future Presidents Douglas Hyde and Mary Robinson, pioneer of the co-operative movement Horace Plunkett, the most important political revolutionary of our times TK Whitaker, playwright Brian Friel, peace campaigner Gordon Wilson, northern politicians Seamus Mallon and Brid Rodgers, legendary jurist Catherine McGuiness, and many more besides. They were all independent voices, all had something valuable to say, and none of them ever sat in the Dáil. They never had to play the parish pump game, and their style wasn’t cramped by party whips. Even now, the standout performers in the Séanad are independent university candidates the likes of David Norris, Joe O’Toole and Shane Ross. We desperately need people like that now, and a framework that allows them to work properly. While the Dáil reflects an electorate based on geography, the Séanad could represent constituencies based on communities of common ground: workers and professionals across the sectors like farming, production and services; the graduates of universities and IT’s, all of them; representatives from the arts, community and NGO sector, the most underrated in the country by miles; and, the most sizeable section of all, the Irish abroad. Of course, the composition of such electorates would take a lot of definition and logistical management, but it is possible. If Italy, with possibly the only other established government more chaotic than ours, can manage a system whereby émigrés get represented in both their legislative houses, there is no earthly reason why we couldn’t do the same, for all those panels. One of the other big problems with the Séanad is that the elections take place so close to the Dáil that they are essentially an appendix to the big ticket event. If they were given their own separate date of election not linked to that of the Dáil - on the same day as Euro and local elections perhaps, or even standalone - then that would go a long way to increasing profile and interest. Ultimately, it comes down to a matter of will. As it stands the Séanad may not have any meaning for the public, any purpose for the deficit hawks, or any incentive to amend for politicians, but we have to look beyond what it is and imagine what it could be. It could be a place full of truly representative national figures, of big ideas, free from partisan politics, with a real impact on Irish life and a mature counterweight to the Dáil. Yes, the Séanad in its current form is a problem, but Ireland has become all too used to burying problems instead of fixing them. Fixing this one is an enormous opportunity to have an enormous effect on the future civic health of the country. But only if we’re so inclined to grasp it.